With one away on school camp, another at university and the third spreading his wings into life outside the confines of the school timetable, dinner time catering has been flipped on its head. From loaves and fishes it has become ‘how do I cram all of these leftovers back into the refrigerator that no one was home to consume but out of habit I cooked anyway?’ As such, I was peering into the chilled shelves when met with the questioning stare of some lovely marinated baked chicken wondering what its next culinary incarnation would be. Thankfully, I have tucked away, a simple and quite delicious chicken curry recipe that requires leftover cooked chicken. This recipe has also dealt with excess charcoal chicken purchases and the unthreading of chicken kebabs that the barbeque crowd simply could not finish. Not only surplus chicken, this recipe requires fresh tomatoes – which we have in abundance right now and any opportunity I have to use them outside of pasta sauce or salad becomes a hallelujah moment. Last winter I became a serious curry cook so my spice library is fully stocked. The remaining ingredients are basically pantry mainstays so I did not need to set foot outside of the kitchen to put this one together. 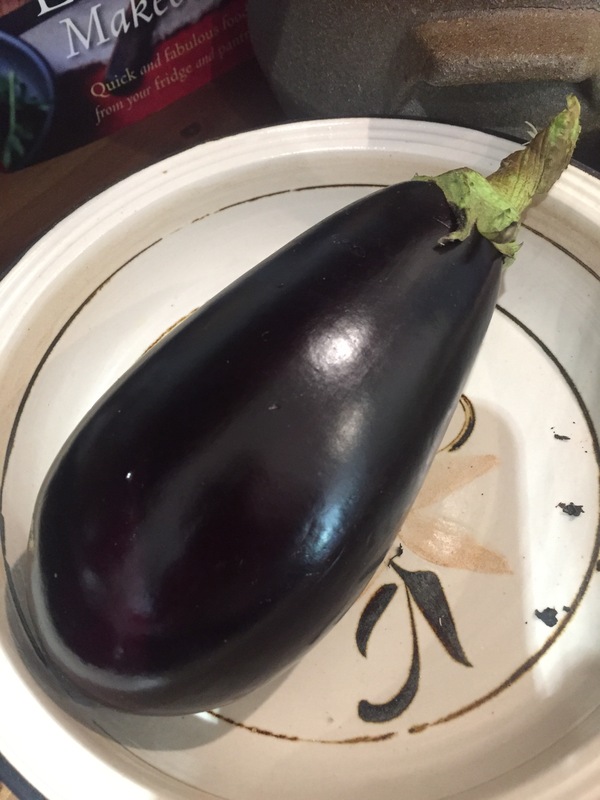 Nearby on the sideboard, two plump eggplant made themselves apparent. They were trophies brought in from the garden earlier in the week and having served their admiration purpose sufficiently were ready for the pot. 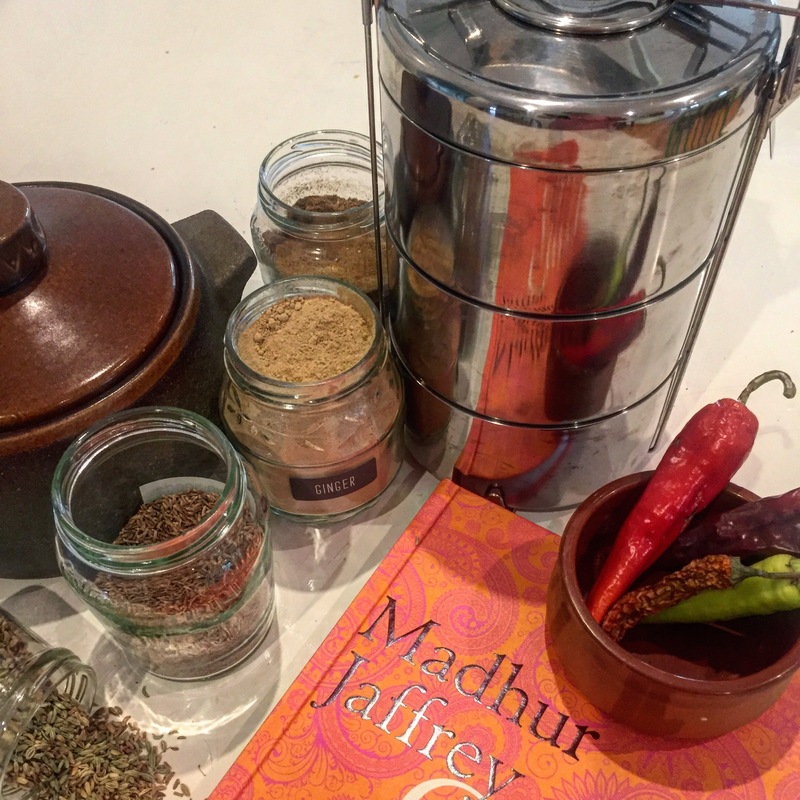 Madhur Jaffrey, my Indian food go to has a simple recipe, Aubergine with Nigella seeds, which my daughter has affectionately shortened to ‘black seed’. This vegetable dish is the perfect accompaniment to any curry, so that’s where those eggplants were going to perform their swan song. With these two dishes underway, all that remained was to boil a pot of rice, spoon out a fresh bowl of yoghurt and pan fry some frozen flat bread for sauce dabbing. By the time you lay all of these dishes out on the table, it appears as if a magnificent feast has been prepared. At this point, I can never resist slipping out to the garden just beyond the kitchen door and plucking a sprig of lemon balm or mint to garnish the yoghurt bowl. It doesn’t really matter who appears at the table, as this meal seems to go around generously and anything left is further enhanced in flavour the following day as the spices are given extra time to develop. A recent purchase of a tiffin carrier means I can individually pack any leftovers and deliver them to a very appreciative grandmother who can also have her own mini feast. I have coveted these little stainless steel carriers for years, my first introduction to them being at a cricket match when Australia was playing against India. I sat behind an Indian family and at lunch break was fascinated as they unclipped each individual pot from the stack and doled out rice, curry and like to all of the family present. Our local supermarket had a shipment of these shiny wonders recently, so of course one was slipped into the trolley with the milk, oats and washing powder. Heat the oil in a heavy based pot and fry the onion gently with the salt until softened. Add the garlic and ginger and fry for a further 2 minutes. Add the spices and cook stirring continuously for 3 minutes. Add the tomatoes and stir through for 1 minute. Add the chicken stock. Bring to the boil and then reduce heat to a simmer for 15 minutes. Add the cooked chicken and stir through the yoghurt. Simmer for another 5 minutes or until the chicken is well heated through.